WPTI is excited to bring back for a fourth year the Job Development Learning Group (JDLG). 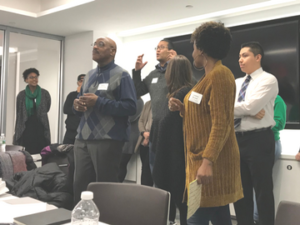 The JDLG is a cohort program designed to equip and empower job developers with skills that best meet the needs of employer partners and program participants. The program will include in-person sessions, expert guest speakers , private sector leaders, and more. The JDLG launched on January 9, 2018 with this year’s cohort in attendance with their supervisors. The day began with a welcome from WPTI’s Executive Director Sharon Sewell-Fairman who shared her story of her workforce development field. 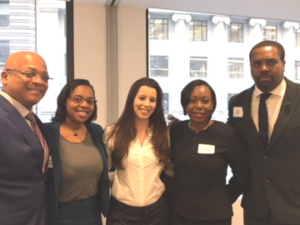 JDLG Alumni Alexandria Bellivan, Employment Specialist at The Actors Fund, and David Thorpe, Director of Strategic Partnerships at Fortune Society highlighted their own JDLG experience, lessons learned, and best practices. The JDLG had its first convening session on January 30 that focused on Labor Market Intelligence (LMI). The guest speaker was Pamela Hoberman, Assistant Director of the NYC Labor Market Information Services at the City University of New York Graduate Center. Cohort members in an ice breaker activity at Convening 1 & preparing for a day on Labor Market Intelligence. Stay tuned for monthly updates from this year cohort. If you are interested in attending one of our other upcoming training workshops, check out our updated training calendar.